Fast action, easy to play! Bone Run is a simple game where players have to click on the “blocks” to destroy them and let the skeleton fall down while avoiding the red blocks. Set a high score and try to beat it again and again! Simple graphics, low on resource consumption. I have tested it on a very cheap android device and it works like a charm! 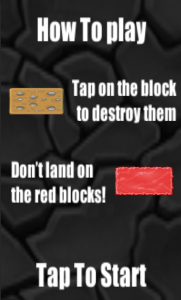 Tip: Tap and drag to destroy multiple blocks.